Activate 1 of these effects, also, after that, Set this card face-down instead of sending it to the GY. ● Send 1 monster from your hand or face-up field to the GY, and if you do, add 1 Flip monster from your Deck to your hand with the same Attribute, but a different name, as that monster before it was sent to the GY. 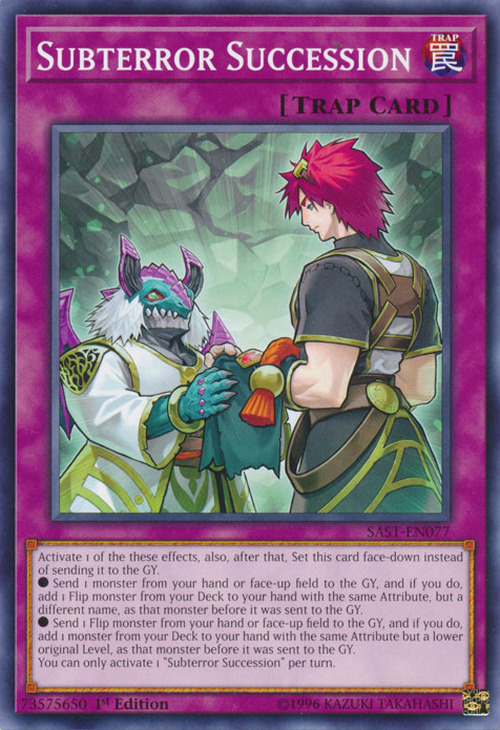 ● Send 1 Flip Monster from your hand or face-up field to the GY, and if you do, add 1 monster from your Deck to your hand with the same Attribute but a lower original Level, as that monster before it was sent to the GY. You can only activate 1 "Subterror Succession" per turn. This card's artwork features Subterror Guru and Subterror Nemesis Warrior. This card's reveals how Nemesis Warrior got his coat.